The best help in the world on the X-T3! Written in plain English for Fujifilm’s outstanding X-T3 camera, this is This is EVERYTHING X-T3 explained in easy to understand language! It is the Manual on Steroids and much more… In it, I assume you are a photographer, so I don’t dive in to the basics of photography (except in an Appendix). Everything comes with clear tutorials and examples. 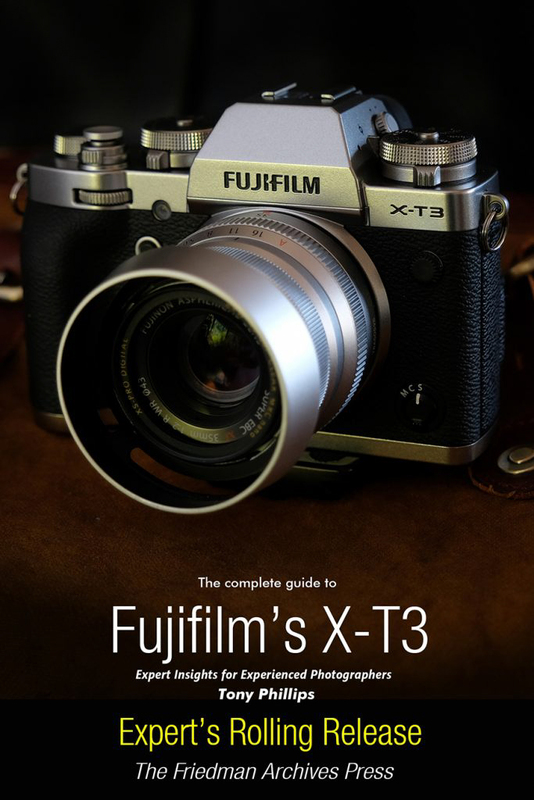 So if you’re uncertain about anything your X-T3 does, grab this book! It’s packed with clear tutorials and examples, with over 900 tips, tricks, and tweaks to help you master photography with your X-T3. And you can try it risk-free – read on for details! * Is packed with over 900 tips and tricks to help you master photography with an X-T3. * Covers every mode, menu, button, function, and socket. * Explains the new Flash modes. * Covers Lighting – even Manual flash! * Includes all my camera settings and an explanation of why on earth I do it that way. * Covers every essential of shooting – like: ISO, Focus, WB, Metering, flash modes – and the more esoteric ones too. * Explains how and why to customize all the buttons and menus. * Has a great tutorial to help you master the ins and outs of RAW. * Explains why all glass (Fuji lenses) are not born equal. * Includes a 22 page Condensed Guide to the Basics of modern digital photography. 2) Printed: For those of you who prefer traditional printed books, this work is available as a printed and bound book in either Color and B&W that will be mailed right to your door. As a bonus, the author (hey! I’m trying to entice you to buy my book! ), gives everyone who buys his book a PDF copy of “Phone Companion Settings”. A convenient, fully hyperlinked 38 page Phone Companion booklet covering all camera settings with EASY explanations for each menu item. you can carry with you in your phone for quick reference. But Wait! There’s more…. A PDF copy of Edition 1 of my other eBook “Mastering Flash with Fujifilm X Cameras”. Plus there’s an XLS spreadsheet listing all camera settings with a brief explanation of each, the author’s own recommendations, and space to note your settings. Tony is an author, photographer, pilot, teacher, lecturer, and lover of classic cars. He has a long-standing passion for photography. To date he has over a dozen published books on photography. Half of them on Fujifilm X cameras and lighting. He is recommended by MirrorLessons as one of 6 Authors of Mirrorless Camera Manuals Whose Books You’ll Actually Enjoy Reading. His book on the X-Pro2 was headlined in Fujifilm’s blog as “The Most Comprehensive Guide on the X-Pro2”. He conducts photographic seminars on the fundamentals of digital photography through to advanced lighting, and is often seen at car shows – either exhibiting, or prowling the display. Or, purchase a printed copy in either Color or B&W.